Gooseberry is a cooler. If added with buttermilk it tastes heavenly. 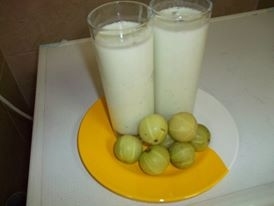 Cut the gooseberry into small pieces. Grind it along with salt, asafodeita, curry leaves and jeera powder to a fine paste. Add it to the buttermilk and add the water and mix well.